With the elderly population on the rise, many of us will have to deal with the issues that develop in our parents as they reach their golden years. Most of us are not doctors or nurses and noticing the subtle hints of problems that can come from aging can be difficult. Kids, jobs, and all the other things that make our lives extremely busy can also make it difficult to notice these hints. 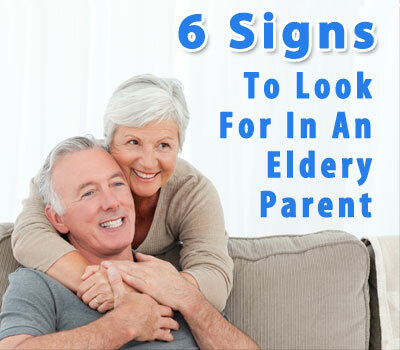 This is why we will explore 6 signs to look for in an elderly parent. Many of these aging signs can be put in two categories “mind” and “body”. Don’t worry we are not going into some existential yoga trip. Instead the main issues that arise with the mind are forgetfulness, changes in personality, and many more. The body usually shows up in the form of decrease in appetite, mobility, illness, bruises and other physical issues. The easiest way to begin to notice your parent is beginning to forget things is if they don’t show up when your suppose to meet them, or they forget you’re coming over. This is usually the easiest to notice because they are not where they are supposed to be or seem surprised to see you when you come over. Some of the harder indicators are if they forget to pay bills or take medication. Many times these types of hints go unnoticed till they are a much bigger problem. Forgetfulness in parents is a key indicator of dementia and can lead to many issues later. Getting a jump start on plans and treatments can help greatly. Many changes in personality can be indicators of different issues that are arising. The most serious of the all is usually depression. Surprisingly depression is much more prevalent in seniors then you might think. It can also be very debilitating and lead to other issues in nutrition and socialization. Changes in personality can be quick diverse and be indicators of Alzheimer’s and dementia. If your parent beings to display these issues it is best to contact your doctor to determiner how to proceed. Loss of Appetite can come from different issues and can be symptoms from combined problems. Forgetting to eat can cause parents to loose weight and appetites to dwindle. An illness can cause parents to loose their hungry and regaining it can be an issue. Loss of appetite can be an indicator that a parent has recently been sick or signs of dementia. If eating becomes an issue one way to counter act it is to hire a caregiver. Caregivers can prep meals, be sure their eating and staying healthy. Assisted Home Care and Hospice has many highly qualified caregivers that can help. Slowing down is the natural course of life as you get older, although balance issues can be very serious in elderly parents. Falls are the leading cause of hospitalizations and cause even worse issues. It is important to keep parents mobile and practice balancing techniques to reduce the chances of having a nasty spill. Check out these tips on elderly exercises for some good low impact workouts. Illnesses, such as pneumonia, can be very serious and even life threaten. These threats are even worse in the elderly because other issues like heart disease that can make it more difficult to fight infections. This is why it is smart to help your parents maintain a healthy nutritional diet and try to reduce things that can suppress an immune system. If you see your parent began to have frequent bruises and or scratches this can be an indicator that their house may need to be looked at for safety. Yes, its true as parents get older their homes need to be optimized for their physical limitations. This may be things like moving commonly used items to lower selves to reduce chance of falling off a step stool. Rugs that are too thick can be tripping hazards, or it can be as common as a simple low end table that they always seem to bump into. No matter what it may be going through your parent’s home and being sure it is safe for them is a must.